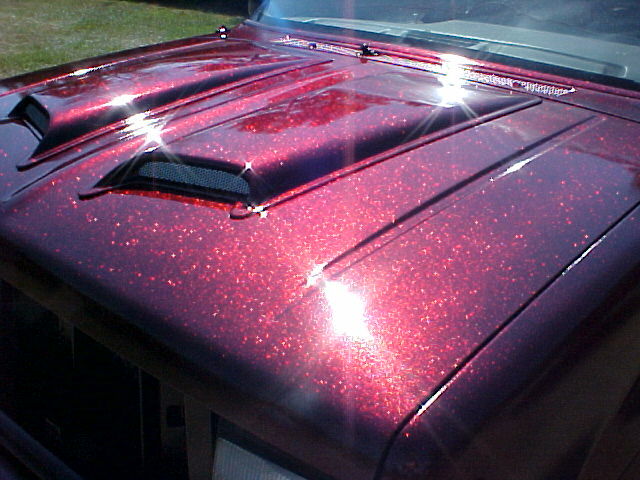 This is my son’s girlfriend’s Explorer that he painted with your Rose Red metal Flake this past weekend. It turned out great, while it was out in the yard drying many friends stopped by to admire it. I must say it is a real eye catcher, to say the least. It was sprayed over a black base coat. We have several more projects lined up to use your pearl paint and metal flakes on. Please give the credit for this paint job to my son, (Shad) he is the one who actually painted this one. Now for the details. He has three coats of flake on the explorer, (2) heaping tablespoons of flake per quart of clear, reduced to about 50%, shot through a Devilbiss gun, at 45 PSI We still have enough flake left from the (one) jar to mix up one more quart of paint. The coverage is very good with just the right amount of black showing through. Neither one of us has sprayed flake before, but after this job, you can bet that we will be using it more often. It’s easy to use and the results are incredible. Once again, feel free to use the picture, we are happy that you thought that it was good enough to use on your site. I know we are well pleased with the results.